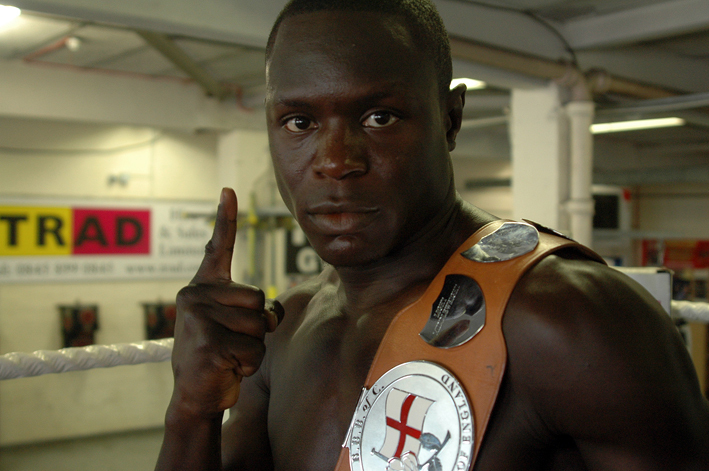 The supremely talented Erick ‘The Eagle’ Ochieng makes the second defense of the English Light Middleweight crown, against big punching Southern Area Champ Ryan Toms, at Alexandra Palace this coming Saturday. The mouthwatering match-up between two of the Capital’s brightest young stars will feature on the Matchroom Sport promoted ‘London Calling’ Super show, which is headlined by Lee ‘Lights Out’ Purdy versus unbeaten Argentinean Gumersindo Lucas Carrasco for the vacant IBF International Welterweight title. Toms’ fearsome stoppage record - four of his last five wins came by way of TKO finish – doesn’t appear to bother Stoke Newington’s finest one iota, as following one of his final sparring sessions at the TRAD TKO Boxing Gym in Canning Town, Erick stated. I’m the Champion, I’m coming to defend my title on the eighth and I’m going to do it in style. Ryan’s a good fighter, he’s a tough southpaw but we’ve got what it takes to be successful in this fight. We know he can fight and he’s got a good left hand so we’re gonna be smart, box him, break him down, we’re going to take him to school on the eighth and put him away. I’m grateful that I always have get hard fights, I’ve never had an easy fight in my career. Some people get easy fights, they get pampered, they get looked after, but when they get a title shot the guy turns out to be not what we thought he was. The tough opposition we always get just brings the best out of me. After this successful defense on the 8th September we’ll be looking for the British or Commonwealth title, because I’m overdue, well overdue. Erick ‘The Eagle’ Ochieng versus Ryan Toms will be one of three main feature fights supporting Lee ‘Lights Out’ Purdy as he challenges Gumersindo Lucas Carrasco for the vacant IBF International Welterweight title at Alexandra Palace on Saturday 8th September 2012. Rounding out the main feature fights is Erick’s TRAD TKO gym mate, British Masters Champion Danny ‘Cassius’ Connor who faces Chris ‘The Flash’ Evangelou for the vacant Southern Area Light Welterweight title. Supporting the four feature fights are five further bouts, heading up the list see another of Erick’s TRAD TKO gym mates, Wadi ‘Machoman’ Camacho in his fifth pro outing against Andy Ingram.